Black Men Walking is the first production of a 3-year programme of work called Revolution Mix, spearheaded by Eclipse Theatre. A marathon-walk through 2,000 years of British history, and not a single white person in sight! Black Men Walking is a defiant and proud look back into our nations past to uncover the lost and hidden treasures of a history we don’t know, yet exists all around us, from the roads we walk on to the hills we hike through. 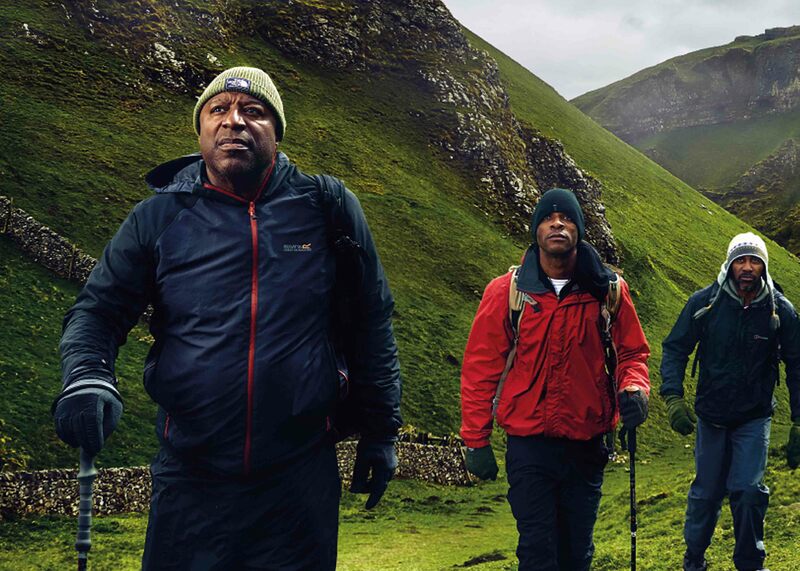 Inspired by the real walks of the Black Men’s Walking Group, Thomas, Matthew and Richard are three Black men living very British, Yorkshire lives. Each has an individual story and perspective that echoes a dimension of multicultural Britain today. And even though they walk together once a month, a freak storm sets this trek apart: it becomes a cathartic trail into their country’s past, where they begin to share stories that lay bare the hidden, missing, local truths that assert their right, as Black men, to be there. Given that the writer, Testament (aka. Andy Brooks), is a poet who himself is inspired by the most celebrated of English poets, William Blake – and whose work he reinvents through his beatboxing talent, this play definitely has all his hallmarks: Blake’s ‘Jerusalem’ springs to mind, but it’s the reimagining of it through dramatic form that impresses most. The juxtaposition of Sebuyange’s millennial character ensures a vivid exploration of the conflict between young and old that any British person of colour will tell you is all too real in their current lives. The play is both lyrical and solemn (the almost gospel-like chorus interludes really should have their own soundtrack! ), and Walton’s directing somehow manages to save a sweeping story that could’ve epically failed; afterall, how could you possibly keep three men walking on stage for the whole play! But she does, and it’s great to watch. Black Men Walking is more a play of ideas than characters, and whilst this probably would be the case given its cautious running time, somehow you leave feeling like there was something missing. It’s probably the fact it was programmed in the Playhouse’s studio space, usually reserved for the rehearsals of their big productions, and it would’ve been great to see it in a bigger space where more people could benefit from seeing this severely required voice of Black representation. But, hey, we’re walking, and maybe one day we’ll get there.